I decided on some lighter fare this time around on Friday Night Frights, so I popped in the copy of Monster X Strikes Back from Netflix. This film, a not-serious sequel to The X from Outer Space, is mainly a comedy and parody of giant monster flicks. The plot revolves around the G8 Summit, where leaders have gathered to discuss the state of the world. They're rudely interrupted when Guilala, the X from space, decides to crash land on Earth and wreak havoc. Now, the leaders are faced with a true crisis that they seem to be unable to handle. Meanwhile, two reporters have stumbled upon a remote village where they might have the scoop of a lifetime when the village god, Take-Majin, decides to answer their prayers and get involved in the fray. This god is played by and meant to represent Takeshi Kitano. That is awesome. The rest of the movie is decent as well. I think it can be enjoyed by all, but a knowledge of monster movies will help you get the most of it, as there are references to several Godzilla films, Daimaijin and more that you might miss otherwise. The score even resembles that of some of Akira Ifukube's more popular themes and music from the Godzilla movies. Most of the tropes involved should be familiar enough to even passing fans though so I don't see anything being lost. The acting by the Japanese members of the cast is good. The English speaking cast members? Not so much. That might be part of the humor too, as they're regularly terrible in Japanese monster films, though there are exceptions. It's a comedy though so I'm not looking for much, though I guess hammy acting would have been better than the cheese we got. I did get a kick out of the UK representative of the summit, who had no accent whatsoever. Could have tried a little bit, I think. Ah well. 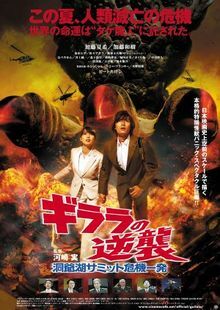 It's not the best monster movie, or even the best monster movie comedy, but it's a decent effort and the nuttiness and charm win you over rather easily, especially after a beer or two.